Stamps/Images: SLS Lines(slscheibe) 'Lady with glass of wine' digistamp. Marianne Design 'COL 1380 Vintage Alphabet' Stamps & Dies. Papers: Making Memories - MM Paper Reverie coll. 'Sienne writ silhouette varnish'. Panduro Hobby - Poppy Design by Vibeke Spigseth 'I have a dream'. Canson Montvale aquarelle paper (200 g/m coldpressed). Embellishments/Tools: Sizzix Tim Holtz Bigz Die 'Tags And Bookplates'. Sue Wilson die Festive Coll. 'Christmas Scene'. Joy! crafts 'Oval Die 0258'. Søstrene Grene washitape. Techniques: My distress tools from Ranger Ink is always in use! ~ Tim Holtz® Mini Ink Round Blending Tool & the Inkssentials Ink Blending Tool and Foams. I used misc. Luminarte Twinkling H2o's Shimmering Watercolors, and Tim Holtz Distress Ink pads & markers to watercolor and distress image and papers. Rangers Distress (Micro)Glaze. As a stencil I used a punchinella. Pebeo modeling paste, white acrylic paint, and Plaid Decoupage glue. I got some blogcandy winners announced in this post! 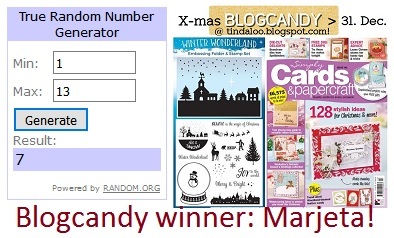 First of all I wish to announce some lucky winners from my last blogcandies, who all will receive a free choice of one digistamp from my etsyshoppe! Kim Rippere, Dr Sonia S V., & Conny Hillgaard! and from my previous blogpost candy: Nikki C.! On my card today I have a little birdy from Beccy's Place, SO cute ♥ not sure if we got this in Norway, but the shape and look very similar to our 'Dompap' that has black, grey and red colorings and is a finch-bird, so I have made him in theese colors! Stamps/Images: Beccy's Place 'Baby Robin' digistamp. Kort & Godt 'M-130'. Lazar StudioWERX Inc rubberstamp 'Funky Holidays' (swirl). Magnolia 'Helylle Hjärta', 'Julflingor', 'Tomte i måne' & 'By siluette'. Papers: Bazzill cardstock. Plain white and brown cardstocks. Panduro Hobby 'Vintage Christmas' and others designpapers. Misc digital frame n papers. Embellishments/Tools: Brown misc. buttons. Marianne Design 'Circle and Flower Stitch CR1248'. Scrapmagasinet NorDies 'ND God Jul'. Martha Stewart 'Flourish Edge Punch'. 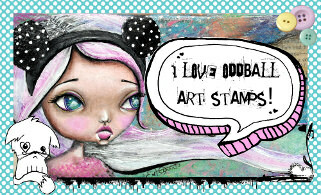 Whimsy Stamps Shapeology Die 'Double Scallop Doily'. QuicKutz (LifeStyle crafts/We R Memory Keepers) 'REV-0130 Cookies and Milk'. Die-Versions - Sweet Petites 'Bells DVP-042-2'. Nille memories ribbon. Techniques: I always use my Scor-Pal to score n fold my cards. I prefer Canson Montvale aquarelle paper (200 g/m coldpressed). My distress tools from Ranger Ink is always in use! ~ Tim Holtz® Mini Ink Round Blending Tool & the Inkssentials Ink Blending Tool and Foams. I used misc. Luminarte Twinkling H2o's Shimmering Watercolors, and Tim Holtz Distress Ink pads & markers to watercolor and distress image and papers. Glossy accents to details on motif.